Choosing to Succeed: See You at the Top! Dr. Ross Reck is the co-author of Instant Turnaround! Getting People Excited About Coming to Work and Working Hard (William Morrow). Reck, along with co-author Harry Paul, show managers at any level what they can do immediately to turn their workplace into a desired destination for their employees and dramatically increase productivity and fulfillment. He is also co-author of Revved! and the best-selling The Win-Win Negotiator. In addition, he is the author of Turning Your Customers into Your Sales Force and The X-Factor. A compelling and dynamic speaker, Reck has been featured at hundreds of meetings, conferences, and conventions throughout the United States, Canada, Latin America, Europe and Asia. His recent consulting clients include Hewlett-Packard, John Deere, American Express, Janssen-Ortho, Inc., Rolls-Royce, the Chicago Cubs, and Xerox. Reck received his Ph.D. from Michigan State University in 1977. 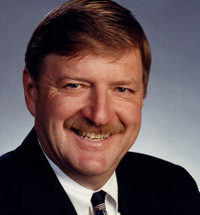 From 1975 to 1985 he served as Professor of Management at Arizona State University. During his career at ASU he was the only two-time recipient of the prestigious "Teaching Excellence in Continuing Education" award and was identified by the university as an "Outstanding Teacher." Since 1985 he has dedicated his full time efforts to positioning his clients for new heights of achievement. "Your talk in Washington D.C. has everyone talking about you and the outstanding job you did. The combination of theory, strategy, and personal stories made your presentation a power-packed addition to our convention." "You hit a Home Run! Your message was timely, on target and, as always, entertaining." "Your presentation on Win-Win Negotiations met with rave reviews from our sales representatives. All feedback was most positive, but people especially enjoyed your enthusiasm and sense of humor." - Patricia M. Hudson, Baxter Healthcare Corp.
"I can't thank you enough for the great program you presented to our group last week. Your energy and enthusiasm are being displayed in our people already. They are still talking about your ideas." "What a terrific presentation you gave to our group in Moline this week! Your enthusiasm was contagious, and I can't wait to get started using your ideas." "Five years ago I attended your program. Since then my business has increased ten-fold! This past year I sold 126 homes and my gross income exceeded $450,000. This success is directly related to what I learned from your program." "You have the charisma to capture the attention of the group, but more importantly you have a compelling message that will help all of us to be more successful." "The best leadership advice for creating a great organization comes from simple truths. Instant Turnaround! is full of these truths. Harry Paul and Ross Reck nail what it takes to get people excited about coming to work and working hard. Read this book." "One of the biggest challenges facing businesses today is getting people excited about coming to work and working hard every single day. In this absorbing new book Instant Turnaround!, leadership gurus Paul and Reck give you the specifics on how to make this happen - in a way that grabs you from page one. Ignore this message at your peril." "This is a great guide and a great reminder for managers at any level in any organization. The story line pulls the reader in and enables you to gain a deeper understanding of the basic rules for keeping great talent committed and energized." "Instant Turnaround! offers sure-fire solutions to boost any business' bottom line, via the most powerful connection ever created: the human connection." "In Instant Turnaround!, Harry Paul and Ross Reck provide the definitive, well-written, treatise on building an employee-centric workforce. No one can read this book and fail to appreciate what truly produces 'dominant impact on productivity.' What a terrific way to help leaders get the results they desire through the way they inspire and more importantly 'care for' their people. This is a welcome contribution to my library and my life as a business leader." "Wow. 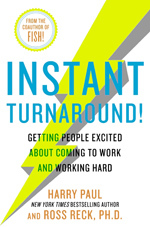 If you want your company, department, team or sales force to achieve more, and have fun, then you need to read Instant Turnaround! Harry and Ross share simple, specific ideas that you can use today to start to turn your company or a challenge at work completely around. Overnight!"